State officials including Lt. Gov. 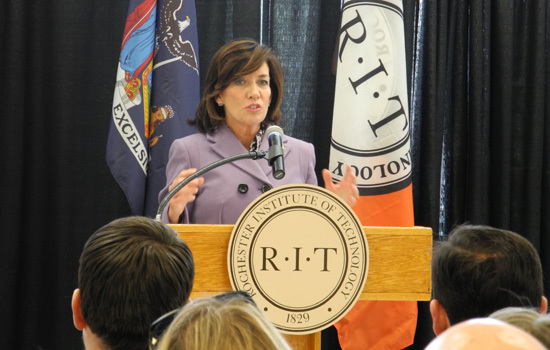 Kathy Hochul and Assemblyman Harry Bronson, standing next to Hochul, helped RIT President Bill Destler and Ryne Raffaelle, RIT vice president for research and associate provost, cut the ribbon on RIT’s Battery Prototyping Center. RIT offered tours and hosted nearly 50 industry executives for a workshop on how they can use the new center, a $1.5 million state-of-the-art facility that will conduct research and work with companies in this rapidly growing local industry. 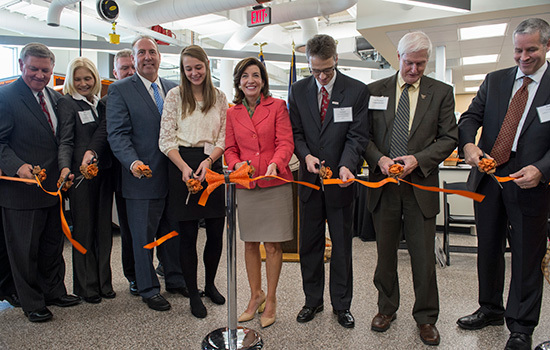 State officials and industry executives joined Rochester Institute of Technology in unveiling its new Battery Prototyping Center, a $1.5 million state-of-the-art facility that will conduct research and work with companies in this rapidly growing local industry. Following the ribbon-cutting ceremony, RIT offered tours and hosted nearly 50 industry executives for a workshop on how they can use the new center. The center, located in RIT’s Institute Hall, will work with companies on prototyping the next generation of rechargeable batteries (such as lithium ion) in an industry-recognized size typically used in consumer electronics, including cell phones. While ultimate applications for these new batteries will include electric grid and transportation storage, this size is a recognized standard for testing and evaluating new prototypes. Companies can either use the laboratory’s equipment to conduct their own trials or hire RIT to do the work. RIT’s Battery Prototyping Center was made possible by support from New York State Energy and Research Development Authority (NYSERDA), Empire State Development (ESD), the state’s economic development agency, and the New York Battery and Energy Storage Technology Consortium (NY-BEST). The center is part of a plan to establish a comprehensive battery and energy storage hub in the region, a priority of the Finger Lakes Regional Economic Development Council. NYSERDA, through NY-BEST, provided $750,000 support for the center. NY-BEST is a nonprofit corporation established with support from NYSERDA to position the state as a global leader in energy storage technology, including applications in grid storage, transportation and power electronics. NY-BEST and its operating partner, DNV GL, provide battery and energy storage technology testing and commercialization resources at the BEST Test and Commercialization Center at Eastman Business Park, enabling new batteries prototyped at RIT to be quickly tested nearby. ESD is providing up to $400,000 in an incentive proposal grant, in recognition of the center’s importance to regional economic development. Several companies have already inquired about working in the RIT Battery Prototyping Center, which will be directed by RIT research scientists Christopher Schauerman and Matt Ganter, Raffaelle said. They will also conduct grant-funded research at the center and will be developing a course to train students in the growing battery industry and educate faculty on the lab’s capabilities. The Battery Prototyping Center also drew the praise of several of the Rochester area’s state delegation. The center consists of conference, office and storage space, as well as a state-of-the art dry room, the industry’s equivalent of a “clean room,” where batteries can be manufactured. Moisture and humidity are very damaging to battery performance, so the dry environment—less than 0.5 percent relative humidity—is essential. The batteries can be fabricated on the semi-automated prototyping equipment line, which greatly improves quality and the ability to replicate the product, compared to batteries made by hand in a laboratory. They then can be tested in one of two environmental chambers where their performance can be measured under a variety of conditions, including extreme heat and cold. The center has been designed to be flexible so that it can adapt as battery technologies change, as well as to accommodate prototyping larger batteries, such as those that may be used in electric vehicles, Schauerman said. Much of the equipment in the Battery Prototyping Center was manufactured by SoLith, an Italian company specializing in battery manufacturing testing equipment. R&D Magazine talks to Mishkat Bhattacharya, associate professor of physics, about his research to create a laser for sound. Cleveland.com cites research by Matthew Hoffman, associate professor of applied and computational mathematics, and Eric Hittinger, associate professor of public policy.